Raul Conti’s works, both paintings and sculptures speak volumes through symbols universal to man. Although he often employs Pre Columbian elements, these works have a proto-historical perspective common to the whole race. Raul Conti was born in Morteros, Province of Cordoba in Argentina, in 1931 and became a USA citizen in 1997. Beginning in his adolescence, under the tutelage of Alfredo Lazzari and Juan Grela, Conti studied throughout Latin America and Europe. His interests have long been centered on the resolution of plastic compositions through the austerity of a palette based on earth tones. Later, he sought the luminosity of forms through the contrast of complementary colors using saturated dyes. He blends the saturated dyes with their complementary producing grays of colors that have evolved in his works. He is committed to the seemingly contradictory worlds of meaning and emotion, expressing basic impulses that appeal to a distant faculty. Raul Conti’s travels and many exhibitions through Latin America, allowed him to explore the symbolic subject matter of Pre Columbian Art. As Hector Cartier pointed out “going beyond that, Conti perceives that modern art after centuries of illusionary visualization , has penetrated (allowing an opportunity for a more significant encounter with those vital roots) into the core of archaic imagery: Images generally born of an image- conjuring world impregnated by mythical and sacred impulses”. His life and work have been divided between his studios in Hells’ Kitchen Manhattan (where more than 100 works are available) since 1977 and Buenos Aires, Argentina where more than 600 works can be viewed by appointment. A prolific artist at 83, he is now in the process of completing his second retrospective book which will be available this year. This quote expresses the importance of life to art and art to life found in every work Conti creates. A celebration of life glows within each painting and drawing in this exhibition. This love of art and life comes from his childhood in Argentina and its past, both European and indigenous, and continues into the present and the future. Conti’s artwork echoes the words of Octavio Paz: “life as art, a return to the mythic lost unity of thought and body, man and nature, I and the other.”[ii] Conti does not limit life to his own image, but extends it to his world, both natural and constructed. We see life as art in the still lifes, the landscapes and the figures, and the abstractions, especially in works such as La Garza de tus Suenos 2013. The introduction of Pre-Columbian elements brings another note to the work of Raul Conti – the magic realism of Latin America. The alchemy of nature, myth and the past melds the intimacy of private life with origins and history creating allegories of interpretive experience. Meanings evolve from visible and hidden spheres. Elements are blended into a realistic atmosphere in order to access a deeper understanding of reality. Rather than explaining reality using natural or physical laws, magical realism creates another reality. The transformation and transcendence of magic realism is revealed in Conti’s works through anthropomorphism, zoomorphism, the refusal to be specific, illusions of similarity and difference and a projection of utopia. For instance, in Un Tema, 2013, we see a mythic scene evidently depicting an artist’s studio in the woods along a stream. Clearly more is happening here than the surface reality and it is our pleasure to investigate the figures and objects and interpret the story. New York has also influenced his art in significant ways. The artwork of Raul Conti manages to be figurative, abstract and symbolic all at once. It is a visual poetry in repose and silence. Its classical compositional principles make it philosophical and universal. He is a clear thinking, conceptual painter with a material feel for the surface of the work. The presence of the material is never forgotten – the large color fields enlivened and varied by his meticulous brushwork. He is a splendid scion of European modernism and the New York School. Conti’s power of invention is exemplified in his shifting and juxtaposition of styles. He is always adventurous and never complacent. For precedents, we might look at the playful Cubism of Pablo Picasso, Georges Braque and Paul Klee. [viii] Conti’s simplified forms combine with the shimmering color to layer intellectual mystery and visual pleasure. Part of this universality is the prominence of woman as in the poetry of Pablo Neruda. “Traditionally, love poetry has equated woman with nature. Neruda took this established mode of comparison and raised it to a cosmic level, making woman into a veritable force of the universe.”[ix] Conti gives us heroic women, as in Serenidad, 2012, infused with femininity and strength. They are surrounded by symbolic flowers and the apparatus of art creation – the essence of creation is all its aspects. The combination of the Pre-Columbian goddess image of earth, motherhood, fertility and love with Conti’s own great romance with his wife Edith, mentioned in the quote above, surrounds the viewer with creation, healing, compassion and life. [i] Raul Conti, 2014. This essay was kindly lent to me by Mirian Conti. [iii] Schneider, Arnd. Appropriation as Practice: Art and Identity in Argentina. New York: Palgrave Macmillan, 2006. [vi] Masiello, Francine. Art of Transition: Latin American Culture and Neoliberal Crisis. Durham, Duke University Press, 2001. In addition to the artworks in The Davis Gallery at Houghton House, two monuments by A. E. Ted Aub are on the main campus: William Smith, 2008 and Elizabeth Blackwell, 1994. 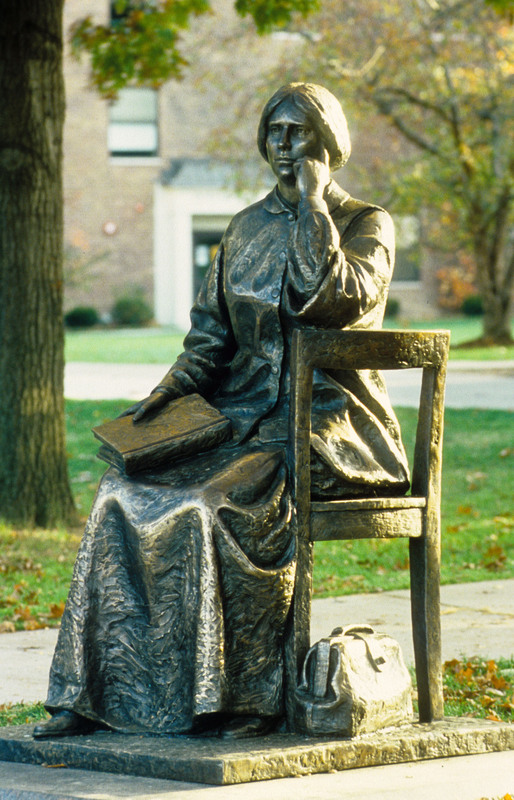 The Elizabeth Blackwell Memorial is located on the quad in the rear of Gulick Hall. The first woman to receive a medical degree in the United States, Blackwell came to Geneva in 1847 to study at Geneva Medical College, an ancestor to Hobart College and the only institution that would admit a female ‘pre-med’ to its all-male ranks. In a dedication ceremony for the sculpture on October 1, held in conjunction with the Kick-Off celebration for the Colleges’ capital campaign, President Hersh underscored the sculpture’s particular resonance for an institution defined by a coordinate philosophy. Working from the few photographs of Blackwell available, as well as her diaries and biographical records, Aub set out to render her as she might have looked as a student in Geneva. “I thought that depicting her as a youthful figure might provide a common bond between this 19th-century woman and our students of today,” he explained. The William Smith Memorial is located on the Hill. On November 7, members of the Colleges community gathered to unveil and dedicate the sculpture of nurseryman, suffragist and educational proponent William Smith amidst a grove of autumnal trees on the Hill, surrounded by residence halls that have been home to William Smith women for the past 100 years. The 6-foot, lifelike bronze statue was sculpted by A.E. “Ted” Aub, professor of art, using photographs of William Smith and models that included Christopher Slaby, a Hobart senior, and Ted Smith, William Smith’s great grandnephew who lives in Geneva. “This statue is a gift from the men of the Board of Trustees to honor the women of William Smith, in recognition of the role William Smith women have played in the success of our Colleges,” said Patterson, after which the statue was unveiled to a round of applause and audible admiration. 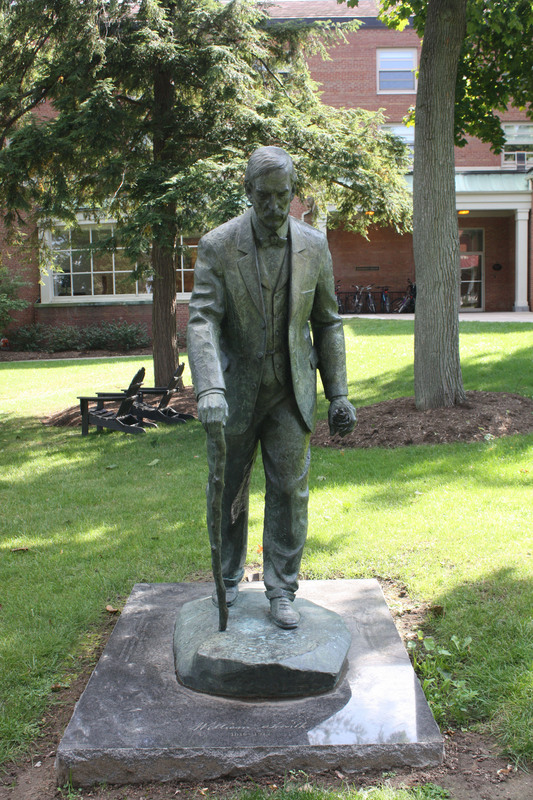 The statue shows Smith leaning on a gnarled walking stick and holding a pinecone, which holds the seeds of the pine tree, the symbol of William Smith College and a metaphor for the continuity of life inherent in seeds.